With the latest outbreak of Measles in Canterbury and with verified cases in Dunedin. Please click on button above for more detailed information. Thank you. This newsletter aims to provide health information and tips for Early Childhood Community in Otago. ​ Please click on heart below for their latest copy. A warm welcome back to everybody. We hope you enjoyed your summer holidays and are feeling well rested and ready for a new year!! Our office is officially open & we are working hard to ensure everything is in order for the New Term! With current research showing the importance of the early years, finding an early education environment that suits you and your family is extremely important. 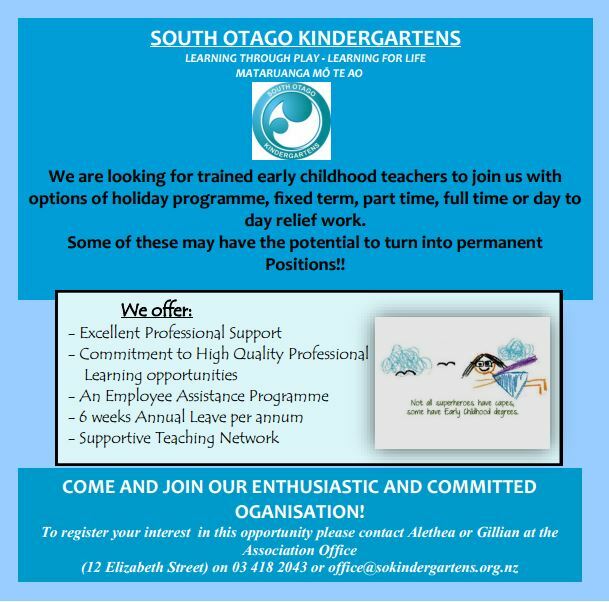 So how will South Otago Kindergarten support your child's growth, development and education? Within our South Otago Kindergartens we strive to provide fun, challenging and exciting opportunities where children can explore, discover, be risk takers develop independence and social skills within a caring, supportive environment. We encourage participation and interactions with families/whanau and our communities. Working through Te Whaariki, our national curriculum, children develop and grow in all areas of learning from literacy and numeracy to science and technology through planned play experiences. We are a not for profit organisation, and have been an important part of the South Otago community for over 50 years. With an open-door policy, you are welcome to come and experience the fun and exciting family atmosphere that our Kindergartens have to offer. Goldfield Kindergartens Term Dates slightly differ from our other Kindy's. Thank you.